All transactions are safe and secure with a reliable history in online purchasing behind each of our associates. 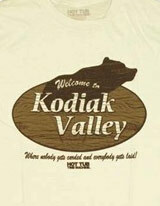 Buy the Kodiak Valley t-shirt to own Hot Tub Time Machine clothing and merchandise. Kodiak Valley, where nobody gets carded and everyone gets laid...at least that is how Nick sells it over Pinnacle to Jacob. If it sounds like a dream come true, then grab this Kodiak Valley t-shirt now. If this isn't quite your cup of tea, then check out the rest of our hysterical Hot Tub Time Machine t-shirts. The Miami Vice tee and the Iron Maiden tee below that Lou rocks during his adventure are a great place to start. Of course, the Chernobly shirt and Great White Buffalo t-shirt are also cool clothing items. I can't decide, but hopefully you can. In addition to the Kodiak Valley tee above, browse the Hot Tub Time Machine Clothing Gallery for more apparel like men's and women's clothes, kids shirts or hoodies.